I have used these strips of currency (obtained from the US Mint via an artist friend) in other works: one about the endangered Ogallala Aquifer in Nebraska; another addressing the influence of money in politics. 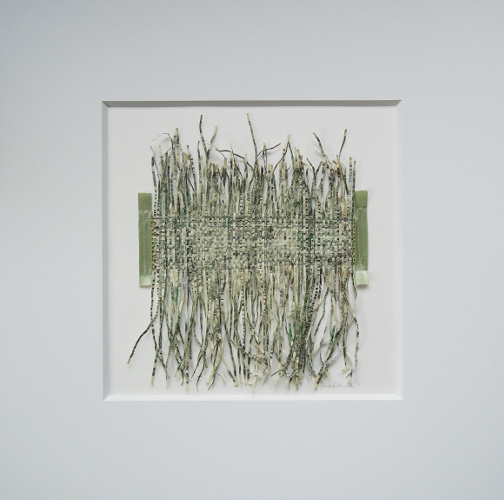 In this piece, I wove the strips together to form a fabric of sorts, bound by ribbons and threads, and sewn onto paper. This national fabric could symbolize consumerism, inequality, corruption, separation, idolatry. It could also represent generosity, comfort, choice, power. It could dress or bind, hold fast or fray, knit us together or distract from one another. It could be the means or the ends. It's a complicated relationship set in a pleasing display.